President Uhuru Kenyatta fields questions from Kenyans during a past virtual interaction on Facebook from State House, Nairobi. 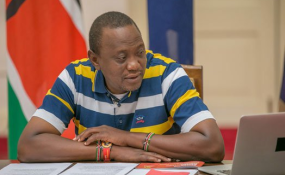 Nairobi — President Uhuru Kenyatta will deliver the State of the Nation address to a joint sitting of the National Assembly and Senate on April 4. A statement on the Parliament of Kenya Facebook page says this is in pursuant to Article 132(1)(b) of the Constitution which empowers the President of Kenya and Commander in Chief of the Kenya Defence Forces to perform such a function. The centre-piece of President Kenyatta's address is likely touch on the progress of the implementation of his Big Four Agenda which seeks to ensure food security, affordable housing, manufacturing and affordable healthcare. The President is also expected brief Members of Parliament on the on-going war on corruption, the economy, devolution and national unity.